Auction Update – Please make note that title search has revealed some minor restrictions to the property. These are basically no mobile homes allowed, minimum square footage of 1200, single family homes only. Please see our website for a full list. Two lots selling combined for a total of 1.5 acres and 153 ft of frontage on the Black River Coming to AUCTION April 9th. Opening bid - $250,000 This is an online only auction. Bidding will begin on April 9th and conclude on April 16th. Property preview will be April 6th from 10am until 12 noon. Bidding offered through Proxibid. Price show is the opening bid for the auction and does not reflect what will be the actual selling price of the property at auction. High bid is subject to owner’s conformation. All pre-auction offers will be considered. Whether you are looking for a final home, a weekend getaway or something that produces rental income this home is for you. Originally bought as a weekend getaway this home turned into a rental dream producing $1,750 in monthly rental income. This 3 bedroom, 2 and ½ bathroom home with eat in kitchen, living room, dining room, game room, large screened porches, upstairs master suite with new large balcony overlooking the river. Home has 2500 +/- sq ft with an additional 250 sq ft enclosed porch and 1000 sq ft of covered porch area. 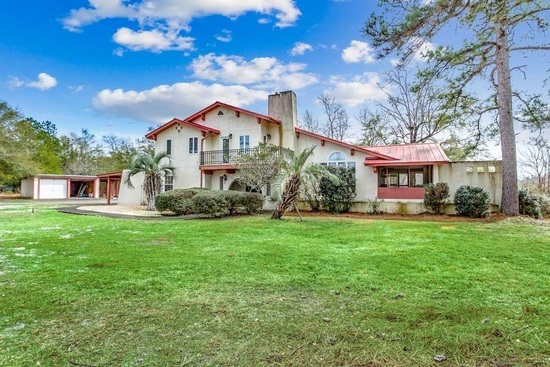 This 1.5 acre property has 153 ft of frontage and a dock on the Black River. Dock has approx. 25-30’ of depth at low tide. Located 3.4 miles from the Browns Ferry boat landing Home is located on two lots that will be offered together, new owner will have option to separate lots and market an additional lot. Currently both lots share one driveway. TMS #’s 02-0133c-005-00-00 and 02-0133c-005-01-00 Auction conducted by Brooks Auction Services. We are the sole representative for and of the seller. Buyer or Buyer’s agent to verify all facts regarding the property including but not limited to square footage and condition of home. Buyer has any and all right to conduct inspections, but any and all inspections must be conducted before bidding in the auction. Terms of the auction will be that the property is selling “AS IS and WHERE IS”, contract will have no contingencies and closing will be in 45 days at attorney of buyer’s choice. Auctioneer only guaranties that the property will transfer with marketable and insurable title. 2% co-op fee paid to realtors who act as buyers’ agents for the winning bidders. 10% buyer’s premium will be added to the bid price of the winning bidder to establish the sales price of the property.